Evaluation of SMARTube to Detect HIV Infection Before Seroconversion Using Standard Methods.2016 Apr 15. New Publication PubMed 2013 Feb 14. New tools in HCV diagnosis, in light of the enhanced awareness and the new drugs for treatment:SMARTube and stimmunology. SMARTube™ presented at the 6th IAS Conference. July, 2011. Rome, Italy. Read about SMARTube™ and preventing mother-to-child transmission during pregnancy as appears in the March edition of European Hospital magazine. Nigerian distributor was granted the official Nigerian approval for the importation and distribution of the HIC & HCV SMARTube™ on the 3/12/2007, by NAFDAC (National Agency for food and drug administration and control) and hence starting the distribution in Nigeria. 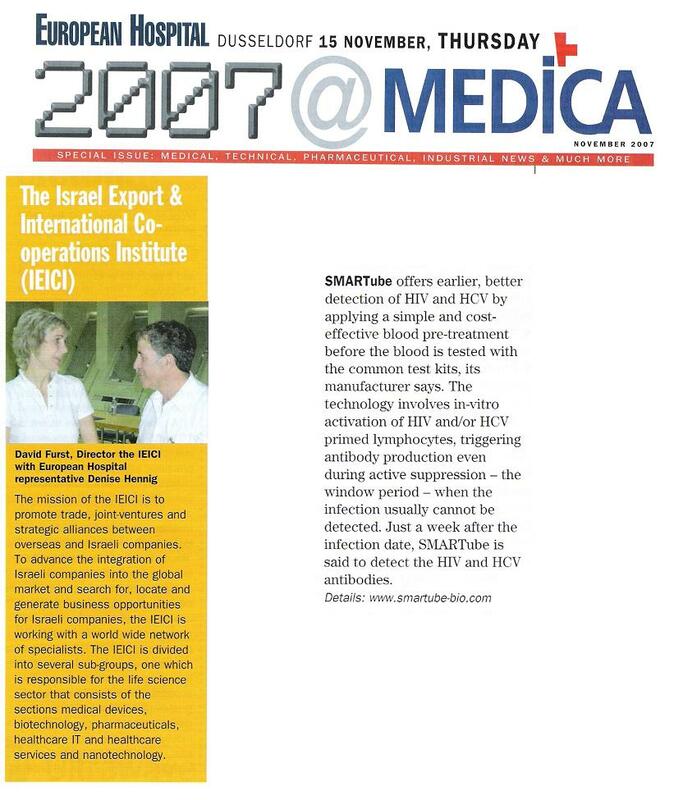 SMARTube™ HIV&HCV in Expansion Magazine. SMARTube™ HIV&HCV in a South African issue. SMARTube™ HIV&HCV in Hungarian news.